Forks of the Credit Provincial Park, located in Caledon, Ontario, Canada is part of the Ontario Parks system and is part of the Niagara Escarpment biosphere. The park is on the Bruce Trail. The Credit River runs through the park. Other notable features of the park include a kettle lake and talus slope. In 1968 the Niagara Escarpment Study recommended that a park be established in the Forks of the Credit area; this recommendation was then accepted by the Government of Ontario. It was officially regulated as a provincial park in 1985. The Credit Valley Railway reached the area in 1879 and built a station at the Forks of the Credit as well as a timber trestle spanning the Credit River. 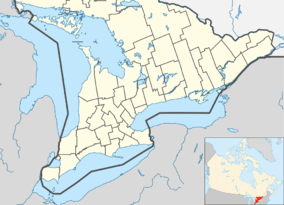 The primary purpose was the shipping Credit Valley sandstone to other communities in Ontario, particularly Toronto and Hamilton, where the product was used in the construction of large buildings such as Queen’s Park and the original Toronto City Hall. No remnants of the station remain. ^ Roots, Betty Ida (2000-05-01). Special places: the changing ecosystems of the Toronto region. UBC Press. p. 275. ISBN 978-0-7748-0736-4. Retrieved 6 March 2012. ^ Wake, Winifred Cairns; Naturalists, Federation of Ontario (1997-06-14). A nature guide to Ontario. University of Toronto Press. p. 115. ISBN 978-0-8020-2755-9. Retrieved 17 November 2010. ^ a b "Forks of the Credit Provincial Park Management Plan". www.ontario.ca. Retrieved 12 February 2017. ^ a b c "Forks of the Credit Park combines hiking & history". erininsight.blogspot.ca. Retrieved 12 February 2017. This Canadian protected area related article is a stub. You can help Wikipedia by expanding it. This page was last edited on 26 February 2019, at 22:28 (UTC).